Nearly a full year ago, the twitter accounts reporting air quality readings for the U.S. Embassy and four U.S. Consulates in China all went silent for an extended period of time. Whatever the cause, they all eventually came back to life. Today when I glanced at my Twitter feed, my attention was grabbed by a tweet from the U.S. Consulate in Shanghai reporting horrendous air quality there. The awfulness of 985 ug/m3 for PM2.5, a particulate matter size which is an especially harmful form of air pollution, is hard to put into words. According to a U.S. government Air Quality Index (AQI) calculator, PM2.5 levels ranging from 205.5 to 500.4 ug/m3 are equal to AQIs ranging from 301-500. For 24 hour exposure, the U.S. EPA categorizes this range of AQIs as "Hazardous" — their worst category. Over 8 years ago when a machine at the U.S. Embassy in Beijing recorded a level over 500 the @BeijingAir account operated by the U.S. Embassy in China described it as "crazy bad". This accurate description was called a mistake and soon replaced with the plainer term "beyond index". To be clear, 500 ug/m3 is the highest level the U.S. Environmental Protection Agency even bothers to categorize. A 985 ug/m3 isn't crazy bad. It's beyond-crazy bad. Wondering what sort of calamity had occurred in Shanghai, I looked at several earlier tweets from @CGShanghaiAir. None of them reported anything near that level. For example, the previous tweet reported a PM2.5 of 118 ug/m3. This is still categorized as "Unhealthy" for short term exposure, but it is far from beyond-crazy bad. I then checked the page on the U.S. Department of State Mission China website the reports PM2.5 AQI data for Shanghai. Aha. The reading for the beyond-crazy bad reading wasn't appearing. The reading for 1 a.m. was also missing. So I went back to @CGShanghaiAir's tweet for that time period and . . .
Aha, again. The missing readings on Mission China for 9 and 10 p.m. similarly matched up to tweets reporting the same level of pollution. I didn't see any similar problems with recents reports for Beijing, Guangzhou, and, Shenyang. But there was a missing time period at the Mission China page for air quality in Chengdu. A tweet from @CGChengduAir for the corresponding time also showed an out of nowhere reading of 985 ug/m3. While it is imaginable the AQI jumping up significantly in a short period of time due to a sudden event such as a major explosion and PM2.5 levels have surpassed 900 ug/m3 in China before, it's hard to imagine how the air quality could jump back and forth so quickly. This combined with the most suspicious readings now not appearing on the Mission China site and the absence of similar high levels in air quality reports for elsewhere in Shanghai, suggests that something was rather off with the recent tweets of 985 ug/m3 levels. Perhaps the consulate's machine had a problem. Perhaps somebody blew smoke into the machine. I don't know. But it sure doesn't look like Shanghai's or Chengdu's air was beyond-crazy bad recently. And I'll be extra suspicious of any future tweets reporting a PM2.5 level of 985 ug/m3. Finally, as I look now . . . @CGShanghaiAir's tweet that immediately followed the reading which first caught my attention reports a PM2.5 level of 81 ug/m3. 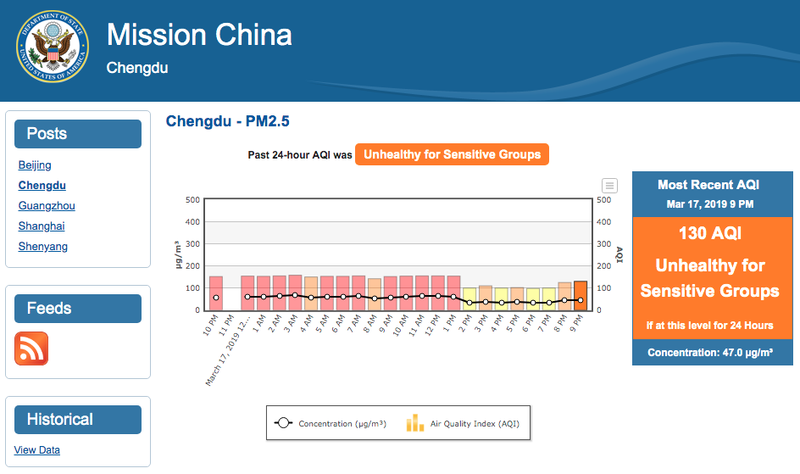 The most recent tweet from @CGShanghaiAir at this time reports a PM2.5 level of 71 ug/m3. Both of these levels are categorized as "Unhealthy" for a 24 hour period. Still, those numbers are nowhere near 985. So to all in Shanghai, relax. I think it's still safe to go outside with a mask on. I'm fascinated by the similarities and differences in how people interpret and react to the world around them. I delve into people's behavior, thoughts, lives, and environments so technology can be more useful, usable, and desirable. For over 11 years I've been based in an especially dynamic country — China. Attribution is considered to be a link to this blog or relevant post and appropriate citing of my name or the blog's name.